This chic pearl necklace adds a touch of style to any occasion. 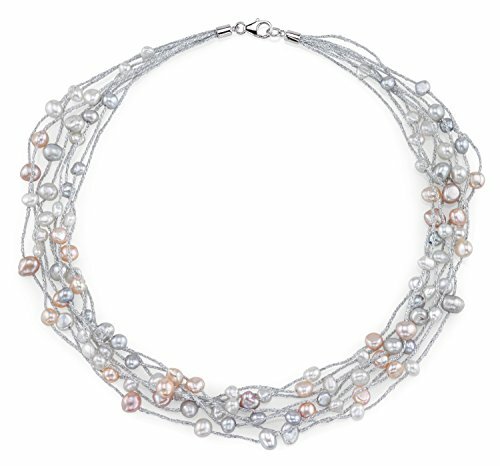 The necklace features 4mm multicolor freshwater pearls braided with silver metallic cotton thread. The necklace is available in either 18 inches or 36 inches in length and affixed with a sterling silver clasp. This item comes packaged in a beautiful jewelry box with an official genuine cultured pearl guarantee. Designer necklace with 4-5mm diameter multicolor Freshwater cultured pearls. Can be worn on any occasion, whether formal evening event or everyday casual. ✦ TOP QUALITY JEWELRY ✦ Handpicked, real pearls with thick and iridescent nacre. The pearls are set on the finest cotton strands and affixed with a Sterling Silver clasp.